If you are newly pregnant (or thinking about becoming pregnant) this post will be invaluable for you. In this post I will share my favorite morning sickness tips so that you will have a more pleasant and joyful first trimester. When I became pregnant with my first child I assumed I would not get morning sickness and would avoid any early signs of pregnancy. I think deep down I thought that if I acknowledged morning sickness as an option, I would therefore bring it upon myself and get sick. Ha! That was a classic first trimester mistake! Much to my dismay, around five weeks into the pregnancy (three weeks after conception) I started feeling like my blood sugar was really low and that if I didn’t eat something to make it get higher, I would become sick. However after eating food, I unfortunately still felt sick. Ugh, that was my first encounter with “morning sickness”. I felt nasty for a long time in my pregnancy. I looked forward to the magical second trimester when at 13 weeks I would stop feeling sick. Yeah, that never happened. I felt yucky until 17 weeks – WAY longer than I expected. Morning sickness is so depressing, and I think because I was feeling down in the dumps I wasn’t even motivated to change anything to make it better. I gave up and wallowed in my misery and felt sorry for myself. Having gone through pregnancy sickness three times there are some things that I would do differently for a future pregnancy. This is a two part post. The first, this post, is a compilation of my ideas to cure morning sickness. 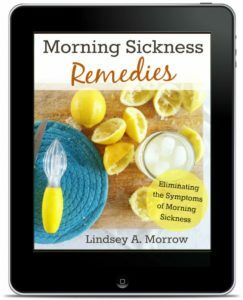 And the second post, is a collection of the best foods for morning sickness relief that I received from Mother Rising readers, friends and family. Below are my ideas to cure or alleviate pregnancy sickness. Food is your enemy and your friend. Eat even if you feel like you will be sick. Eventually, the food will make you feel better so it’s worth it in the long run. Don’t wait too long between meals and snacking. Eat a mixture of protein and carbs/sugars. For example, cheese and apples. In the morning, eat anything that appeals to you. A bowl of cereal is a good option. After you have eaten something appealing, try to eat protein like an egg. If you can eat this, it will carry you till your next snack or meal. Plan for snacking when you’ll be out of the house. Bring a bunch of snacks with you and carry them in your purse. Don’t be like me and assume you’ll be fine. Prepare for the inevitable and bring food. Visit your mother (or other friends and relatives) and have her cook for you. When I got out of my house and kitchen, and someone fed me I felt amazing. As soon as you find out you are pregnant but BEFORE you get morning sickness, clean out your microwave, fridge, garbage cans and clean your bathrooms. This will lessen any weird lingering smells. Take the trash out every day. Do not let trash fester. Have your partner or husband open the fridge and take out the items that you need. Every time I opened my fridge I would gag. Make your house smell wonderful. Light your favorite candles or diffuse some essential oils, but make sure you love the smell. If the smell starts to stink, switch it up! Have some lemon essential oils on hand. Or a lemon. Sniff it when you think you’re feeling sick. Get plenty of sleep and takes naps when you can. Keep busy. Some of my less sick times was when I was at work, very busy. Consider public speaking. I know this sounds insane, but the adrenaline from public speaking negates morning sickness. Keep a set of essential oils for morning sickness at work and/or in the car. Essential oils are perfect for preventing you from “losing it” in the worst of circumstances. Light a candle and/or use a diffuser for essential oils at work. Keep a trash can handy and make sure it has a liner. Keep a stash of pads handy as well. Sometimes the force of vomiting can unfortunately make us pee our pants. Those are my morning sickness tips how to cure or alleviate morning sickness. If you are interested in learning more about morning sickness so you can best treat, reduce and hopefully ELIMINATE your symptoms I have written many articles all about morning sickness remedies. Hop on over here to check them out! My "Go To" breakfast was toast with a generous spread if peanut butter and banana. Also wake up early enough to allow yourself time to feel funky, get breakfast and get ready for the day. Cheerios multiple times a day, especially before stepping one foot out of the bed. I also drank lots and lots of really cold water any time I started to feel nauseous. It was actually a huge help when I had heartburn at the end of Pregnancy as well. Cold water is the best! My best pregnancy (4th) I was taking milk thistle and a b complex for a month before I conceived. It was the only pregnancy I wasn't horribly sick. I still felt queasy for 21 weeks (I stay sick a long time..lol) but nothing like my previous pregnancies one of which I had hypermesis. Cheerios first thing in the morning, while laying down. Vitamin B6 at bedtime, definitely. Snacks between meals. Green olives. As soon as I felt a little nauseous I would eat a few. I went more than a jar of olives a week. Later, after my pregnancies I read than the tannins in the olives can help alleviate nausea. Omg That is why green olives works for me? I can't believe no one has suggested ginger yet! You can buy crystalized ginger (it's almost like candy) and just carry that in your purse to have at all times — I like combining it with almonds for a trail-mix kind of snack. Also, I found that eating small but frequent snacks (think all-day grazing) worked a lot better than trying to eat an entire meal or worse, not eat at all! If you can't get anything down, salted pretzels are also always a good bet. I'm 11 weeks right now and have been in a horrible state of morning sickness for 6 weeks now. it's exhausting! I've been through so many different foods that for a few days were all I ate and then had to move on to something else. Potatoes have come and gone a lot! Baked potatoes saved me many times and a couple potato chips if i need to just curb the feeling to hold me over til later. Cheese! I eat a lot of cheese but I also did before pregnancy too. Ginger never worked for me and fluids have made me more sick than food. 🙁 I love cantalope and grapes! mmmm they go down easy. Those things have been my major friends in the last 6 weeks 😀 I hope those help. black licorice, and lemon drops. I lived off of cereal. The cold milk felt good on my stomach too. Cold foods are really the way to go since they don’t carry the smells like hot foods. My first doctor actually suggested chicken soup. Worst idea ever!! Much better suggestion was cold chicken salad on a cracker. I too am hoping that I can benefit from what I learned the first time and fare a little better with the second. Remember to stay hydrated too. Being dehydrated will make you sicker than anything. I have been getting the worst morning sickness you could ever imagine for almost a month now. I tried everything to reduce the nausea and the vomiting but its not working good for me. I tried searching alternative things to help with the morning sickness and i came up with this article about cannabis and this certain kind of strain at https://blog.bonzaseeds.com/stardawg/. Im a little afraid for the fact that im pregnant and thinking that i could affect the baby inside me. What should i do? MJ is contraindicated in the US. Many studies have been publushed in other countries where pregnant mother ingest it religiously wiyh bo adverse affects on the baby. Consider doing your own research and consider the repercussions. It is perfectly safe to smoke marijuana, ingest CBD oil, and ingest marijuana edibles while carrying a child. Cannabis activates something in the genetic code that actually makes children exposed to hemp and marijuana smarter. I would try to stick to a strain high in CBD and make sure you get some hemp oil (CBD oil) as hemp and marijuana are two different plants and you will benefit from the medicine in both of them! Great post. I would like to share some more related information. I would AVOID using cannabis . Just because people in other countries do something culturally, this does not mean it is a good idea. Drinking alcohol in pregnancy used to be recommended until it was studied, and now it has well-known affects on fetal brain development. While I am not an OBGYN, and have not studied in utero exposure of cannabis strains, I can point you to strong evidence of the effects of daily marijuana use in adolescent brains x2 years, which shows literal holes in blood flow to certain brain areas (follow this link, http://klaybor.blogspot.com/2013/04/brain-on-pot.html?m=1 for an example). Please consider whether weighing nausea and vomiting for weeks is worth a lifetime of coping with intellectual disadvantages in your little one. My recommendation: stay away from cannabis strain experiments. Take care of yourself through other, known healthy means.